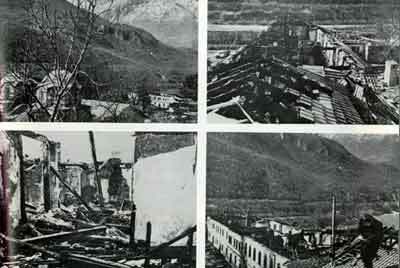 After the Kosovo war in 1999 the Patriarchate of Pec is constantly exposed to the threat of Albanian extremists who have destroeyd more than 100 Serb Orthodox shrines in the Province after the war. At the moment the Convent is under strong Italian millitary protection. 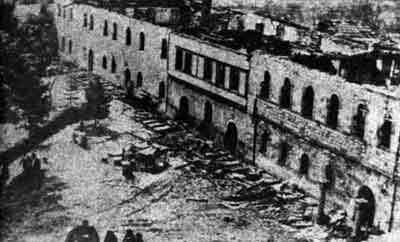 To understand how serious the threat is it is important to remember that the Albanian nationalists burned the largest dormitory of the Patriarchate monastery in 1981 in order to uproot the most important spiritual center of the Orthodox Christianity in this region. 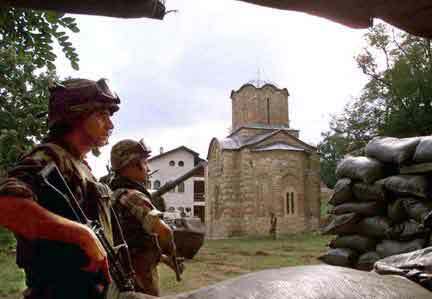 Monasteries and churches under constant military protection are the best picture how free the post war Kosovo is and where it is heading to. While dozens of new Saudi Arabian sponsored mosques rise in the surrounding Serb Orthodox churches disappear under the terror of Kosovo "talibans". Mutlated body of Slavoljub Radunovic. Photo by UNMIK police. The body was brought to his mother in the monastery in a plastic bag. 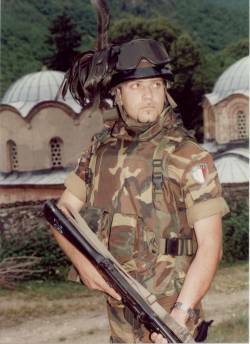 Murdered by Albanians in Pec, December 1999. Slavoljub, a mentaly retarded young men, left unnoticed a safe shelter in the Pec Patriarchate and entered the town of Pec to see his home. Being detected as a Serb he was immediately kidnapped and ten days later his body was found mutilated.